Saturday, November 20: Welcome to PsxFanatic's Playstation and McGwire Page. On this page, you will find links to Reviews, News, and Previews of all the hottest games for the Playstation Game Console. (Follow the links in the Links section below to go to my other Psx Pages!) 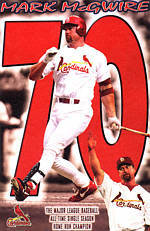 You will also find information on the St. Louis Cardinals and Mark McGwire. During the offseason, I will be updating the Cardinal and McGwire Pages with news from inside the team and around baseball. Enjoy! Cards get Kile in seven-player deal: The Cards obtained a frustrated Darryl Kile from the Colorado Rockies in a seven-player trade November 16. Along with potential number 1 starter Kile, the Cards also got a new closer in Dave Veres, and pitching prospect Luther Hackman. Veres had a very productive year for the Rockies, saving 31 games in a hitter's ballpark. To complete the deal, the Cards traded righthanders Jose Jimenez, Manny Aybar, and Rick Croushore, plus minor league infield prospect Brent Butler. Darryl Kile had a miserable 1999 with Colorado, ending up with a record of 8-13 with a 6.61 ERA. The Cards are hoping a change of scenery will help Kile return to the form in which he won 19 games for the Houston Astros in 1997. In two seasons with Colorado, Kile was 21-30 with a 5.84 ERA. Cards get starter Hentgen in five-player deal: The Cards obtained a potential number 1 starter in Pat Hentgen from the Toronto Blue Jays. The Cards traded away backup catcher Alberto Castillo, left-handed reliever Lance Painter, and minor league right-hander Matt DeWitt. Along with Hentgen, the Cards obtained left-hander Paul Spoljaric in the deal. Hentgen finished the 1999 season with an 11-12 record and a 4.79 ERA. Hentgen comes to St. Louis with a $6 million contract for 2000 and an option for the same in 2001. Hentgen won the Cy Young award in 1996, but has only been average over the past three years. Hentgen also suffered from shoulder tendinitis in 1998. Questions or Comments? Write to me at cosmo@interpath.com.